Writer/Director Richard Linklater understands the messiness of life. He also recognizes the extraordinary in the ordinary. He has tapped into this unique wavelength with movies like Slacker, Dazed and Confused, Waking Life, Bernie, and especially in the Before series (Sunrise, Sunset, and Midnight). These movies represent a filmmaker who is not afraid to experiment for the sake of cutting to the truth of the human experience. 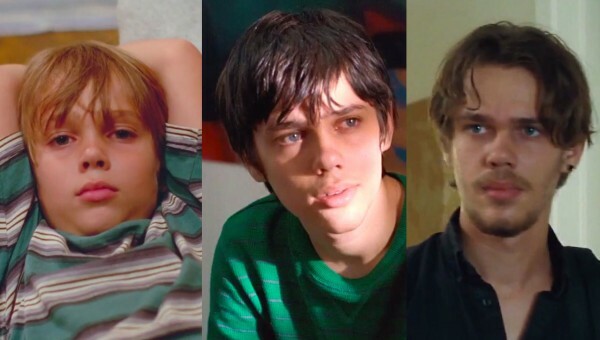 In his latest movie, Boyhood, Linklater tackles his most ambitious project to-date. Filmed over 12 years with the same cast, the movie is a groundbreaking story of growing up as seen through the eyes of a child named Mason (a breakthrough performance by Ellar Coltrane), who literally grows up on-screen before our eyes from ages 5 to 18. Ethan Hawke and Patricia Arquette portray Mason's divorced parents and newcomer Lorelei Linklater (Linklater's daughter) plays his sister Samantha. In addition to Mason's aging process, we also witness his parents and sister getting progressively older and navigating life's unpredictable terrain. What Linklater has created is a remarkable act of daring. So many elements could have gone wrong during the 12 years of shooting. Actors quitting or passing away, footage being damaged or lost, etc... It's rather impressive that the whole project was able to come together in such a smooth manner. There have been many coming-of-age stories over the years, but sticking with the same group of actors over a long-span of time, produces a movie that is a special feat of filmmaking. One that has never been tackled in fictional cinema prior. In addition to the unique process of creating the movie, the story itself is a thing of simple beauty. Linklater is presenting life in all of its ebbs and flows, but he never succumbs to clumsy clichés or overwrought melodrama. He also presents each vignette as if life is unfolding in real-time. The aging of Mason and the other characters never feels jarring and develops naturally. There are not any big dramatic "moments," but rather the movie focuses on those small and telling stages of life that define us as people. We view Mason's evolution with him dealing with divorced parents, difficult classmates, an antagonistic sister, his mother's taste in troubled men, the awkwardness of adolescence, and grappling with the unknown future of impending adulthood. The whole extent of our collective formative years is represented through the viewfinder of Mason. Linklater is able to get delicate and remarkable performances from his cast. Newcomer Coltraine is superb in portraying the transformation of Mason. He brings a laid-back quality to the character, but also a subtlety in portraying the various emotional periods of his life. Growing from a precocious young boy to an observant and artistically inclined teenager. Ethan Hawke is excellent as Mason's father and delivers one of his best performances. His transformation from a loose and fun dad to a more traditional father role is remarkable, honest, and touching. Patricia Arquette has the most daunting task as Mason's mother. She is asked to lift the heavy burden of a single mother with two children and deal with the consequences of bringing troubled men into her family. Arquette brings a moving vulnerability and rawness to the struggles and joys of motherhood. There is a scene towards the end of the movie, involving her and Mason, that will resonate with anyone who has been forced to let go of an important part of their life. It's a poignant scene and both Arquette and Coltraine get to the complicated heart of the matter. Her performance ranks as one of her finest. Linklater effectively uses music in the telling of his large-scope story. Music from Coldplay to Arcade Fire provide the proper soundtrack for alternative music of the last 12 years. The music also informs the varying stages of where the characters are in accordance to the world, from the tumultuous environment of a post-911 existence to the Obama administration. Music is handsomely layered throughout as a time capsule. Sandra Adair's editing deserves much praise for weaving together 12 years of footage into a seamless whole. She and Linklater pace the movie in a manner that never drags. They inform the audience that the story is shifting in a natural style, which never feels forced. The transitions of the aging process are handled expertly. Linklater has created a rich and layered tapestry of life and how our formative years transform us into the adults we are today. But also how as adults, we never stop growing or learning. This is a movie that will resonate with most due to Linklater recognizing those little moments of life that connect us all. One of the most touching scenes in the movie involves an exchange between Arquette and Hawke's characters. They share an acknowledgment that will move anyone who has been the product of a divorced household. Linklater has created something that should be cherished and talked about. He has once again pushed storytelling to new heights by locating the humor, sadness, anger, confusion, frustration, joy and curiosity of being a child in the world. It may be too early to call the movie a masterpiece, time will tell, but it is easily one of the best movies of the year and captures the universal authenticity of humanity. Linklater's sharp writing and directing. Strong performances from the actors. A great alternative soundtrack of the last 12 years. Captures the honesty of growing up in all of its awkward stages. I have no quibbles, the movie is perfection for me.